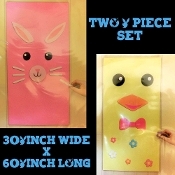 Create Your Own Door Covers Wall Murals with Adorable EASTER BUNNY and CHICK Spring Character DIY Face Pieces. This Pair of Cute Holiday Critter Theme Wall Posters make Colorful Fun Birthday Party, Bedroom Closet Door and School Classroom Decorations. Perfect Prop Backgrounds for a Photo Booth Backdrop! Create your own with included do-it-yourself adhesives and cutouts, as pictured. Why not add your own personal touch using your own permanent markers or glittery stickers?